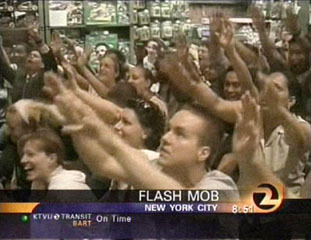 A Brazilian flash mob has hit the busiest road in Sao Paulo. Around 100 people gathered in Avenida Paulista and pointed remote controls at a giant screen, as if they were trying to change channels. After exactly three minutes they put the controls away and walked off as if nothing had happened, Folha de Sao Paulo newspaper reports. The first Brazilian flash mob happened last week when a crowd converged on a Sao Paulo street corner, removed one shoe each and beat it on the pavement several times. 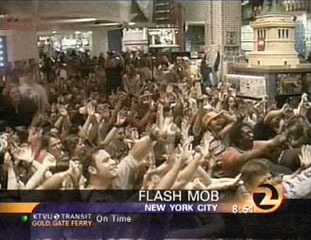 The flash mob phenomenon, in which crowds organised by email and websites perform pointless stunts, started in the US and has spread around the world. This is from the August 7, 2003 program on KTVU Channel 2 in San Francisco. This article covers last week's Flash Mob in New York City. This is wireless technologies (and, ideally community wireless networks) are so important. They help us to organize and communicate with each other. This time it was to organize the protest. Next time it might be to discuss an important issue or to provide eye witness accounts of some other event that has just taken place. To let loved ones know that you're okay -- or to tell friends and neighbors where not to go when there's an emergency. Wireless can help us get organized -- which is what it's all about right now. By Jessie Seyfer for the Mercury News. Sent from the thick of Thursday's massive demonstrations, these messages are an example of how protesters are using the latest technology to communicate and coordinate their activities. Over the past three days, activists created pirate radio broadcasts that streamed live on the Web and were rebroadcast at numerous sites across the world. They uploaded live video of marches to the Internet and sent hundreds of digital images of clashes with police to the Web. And they communicated on those cell phones to keep close track of one another's whereabouts. Police officers have used walkie-talkies and wireless radio communications for decades. Now, the digital revolution has put mobile technology in just about everyone's hands, he said. Thursday, demonstrators used it to play a cat-and-mouse game with police. Once protesters were forced out of one intersection, they coordinated by cell phone and swarmed another intersection, Rheingold said. The bulletins came rapid-fire, straight from a San Francisco protester's wireless handheld device to a Web page for all the world to see. Instant communications helped the protesters stay ahead of events and solidify their community. But whether they went beyond the ranks of committed activists to reach a public that, polls show, support the war by ever-widening margins, remains to be seen. Within the movement, the technology that is bringing the 1960s adage ``Do your own thing'' back to life is spreading around the globe, to hundreds of Web sites and makeshift newsrooms from Idaho to Jerusalem. Experts say the technology-enabled, do-it-yourself ``Independent Media Center'' concept was born during the 1999 World Trade Organization protests in Seattle. All this digital documentation represents the face of the movement that is opposing the war in Iraq. Thursday's bulletins from a protester's handheld, for example, were sent to sf.indymedia.org, a Web page where demonstrators are encouraged to self-publish in just about any possible way. Mercury News Staff Writer Dana Hull contributed to this report. Contact Jessie Seyfer at jseyfer@mercurynews.com or (650) 688-7531. 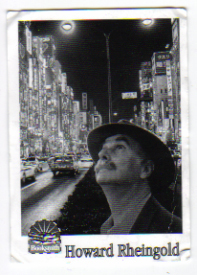 I went to see Howard Rheingold speak at some bookstore on the Haight a few nights ago -- I've read excerpts from a friend of mine's copy of Smart Mobs: The Next Social Revolution, and I can already highly recommend it. Howard also recently did an interview on the well too. This is not to say that smart mobs are wise mobs. Not all groups who use new technologies to organize collective action have socially beneficial ends in mind. Criminals, totalitarian governments, spammers, will all be able to take advantage of new capabilities -- just as the first to take advantage of tribes, nation-states, markets, networks included the malevolent as well as the cooperative. Please join me in welcoming Bruce and Howard to inkwell.vue! exciting to have the chance to talk with you here about all this. are at the beginning of an important social-technological revolution. conversing as if this was normal. serious research when I read reports about the "People Power II"
forward it to everyone in your address book. beyond -- the PC and Internet waves. the Internet and PCs in being mobile (and relatively ubiquitous). Anything else that's distinctive about the tech? And why is this revolutionary, rather than just more of the same? technologies, social contracts, and collective action. enterprises of self-governance and science emerged. community story. Ebay adds a reputation system, and a new market emerges. speed is probably a thousand times faster. malevolent as well as the cooperative. our mates were limited to our mates (and offspring and forebears). could try to limit who communicated and what. right out of the gate for dealing with this new arena. familiar with the last decade of political wars over the Internet. online communication have not reached. One in eight people in Botswana have mobile telephones. local women -- and the shops have become new social centers. communications were not available before. previously been considered technically impossible -- control of the Net. aggregators are consumers. It wouldn't be wise to be too optimistic. of the stakes and the players, entrenched interests will certainly win. Well, that's a great image, anyway. describing me would be "ten miles wide and a quarter of an inch deep." goes along with that wealth. These aren't widget-manufacturing industries. be happening in the world. slice of spectrum, but sends out ultra-short pulses over all frequencies. legislators. Yochai Benkler at Yale has proposed an "open spectrum"
other parts are opened to be treated as a commons. access points that have been deliberately or inadvertently left open. contract that permits bandwidth sharing. scheme to blanket the entire country with WiFi access. use cities. I get into this at slightly greater length in the book. Web as we know it. cofounder of the Well, is deeply involved in that. have to trot into the house for Net access. Here's an interesting back-of-the-envelope speculation. class consumer -- around $2000/month. The average monthly income of the world is around $40. to each other, and organized themselves. out of that. From hand waving to semaphore flags or smoke signals. Then drawings were made on cave walls. Pictures. Followed by symbols. Fixed on walls or rocks. between groups, independent of who was carrying them. scribes painfully duplicating the important ones in small numbers. consumers of what communications brought. and locally publish. Followed by modems. to a pc, a laptop, a mobile pda. the first humans 'talked' to each other! communciating with another, THAT I propose is Revolutionary. on the act of communications with another mind. So THEN groups will begin to function very differently. to connect up all 6 billion minds on this planet to each other. We have the technology, can afford the scale. I think its an experiment worth trying. parliament on a scheme to blanket the entire county with WiFi access"
with that. Where is that crazy American"
civic leaders, south to north. And do a 'model' valley wirelessly. of linked satellite-wireless, and a few bones thrown to BT for ADSL. since 1996 via the soc.culture.wales newsgroup as any other way. 3 miles (a nice wireless distance). 600, they calculated. culture (in Welsh and English or whatever) of THAT one e-fro community. Well, it appears to have hit a deep nerve midst the Welsh people. and technology to express it, to make it valuable to others. mobbery may turn out to be a bit more than that in the long run. get connected, become prosperous, retain their culture. Dave, thanks for joining us! Great recap of the history of technology. called, "Are the Tools the Rules? The Future of the Digital Commons,"
inkwell.vue topic 146, "On the Scene: CFP 2002"
rather than law of nature. global phenomenon by the end of the decade. coordinate activities using these means. are the councils coordinated? Do they translate cross-culturally? other networks learn from them? and not Cultures to Technology. historical way humans have evaluated each other. even within age groupings from otherwise cohesive local communities. in my small-scale (3 blocks long) Old Colorado City neighborhood. across cold space with ultra-modern design (ergonomically) tools. been for 18 years - same leased space - is a virtual company. blocks from it. Our staff is scattered from Dallas to Richmond. took my fingernails to grow to where I needed to clip them. to guard against gaming -- another classic arms race. reputation systems, you can start with the references there. round games but fail terribly when the game is repeated. say, don't depend on any ongoing relationship between the parties. to deal with the consequences of doing you wrong. systems we should pay attention to? How are they different? "mobile" or its Latin cognate, denoting a moving crowd of people? Howdy, ! welcome to the party. the Well right now as i can imagine. I didn't know that, Christian! I appreciate the opportunity to learn. these questions must involve both social and technical disciplines. For example, Boeing has close to 80,000 employees in the Seattle area. application that might make a big difference. metric in 's approach to finding the auction items he wants. are definitely colorful characters, if not heroes, of the book. "the cornucopia of the commons." in all places at once! No, we'd just need to assimilate Canada. This mob is too smart for itself! The Big Guy dole things out under conditions of artificial scarcity? favor the one rather than 'tother? 3. What are the most effective conditions for producing a good? it. I'm continuing to read about these issues. to innovation, education, and discourse? billy dee williams: land o calrissian. starship could communicate in real time. that you mention in the book. these two might change as smart mob technologies evolve? be outgunned by lobbyists. At least that has been the case in California. Maybe Scott Mcnealy was right: "Privacy? We have no privacy. Get over it." I'm not optimistic about this aspect. to change the clock display on our VCRs? a counter force that might cause the pendulum to swing back again. eBay is a market that shouldn't exist ..."
the conversation here has inspired me to do a bit of my own research. human judgment and decision-making under uncertainty..."
there are actual experiments as well). Issues that you mention above "ride sharing" <#24> and "public goods"
I assume its only a matter of time before the "natural experiment"
more formally - if I find something sooon on that I'll let you know. 166: "Privacy? We have no privacy. Get over it." can make laws that govern how and where we may be surveilled. expecially when we are able to act without planning and reality-checking? were orchestrated by instant messages ordered by Islamic leaders. organized in part by text messages to mobile phones. > and don't advertise if you love Allah and Prophet Muhammad (PBUH)." like mob with a capital M, with powerful leadership. civil, according to one set of values, but it is an eye-opener. compared to most citizens, I'm an arch-geek. and the Nature of the Firm"? Just want to be sure I've got the right one. Hello all - catching up on the topic. happened even without the new technology that was involved?
. Two if by sea." was a powerful and fast low tech message delivery. effective way possible to communicate. I missed that pointer in <37> above, Howard. groups too. Perhaps time will tell. texting may lead to a more flexible sense of time. demonstrations are non-violent or necessarily democratic. action in a broader and longer-term context than flash-crowds and mobs. communication, affordability of communication, and other factors. Jon -- yes, that's the Benkler essay that Phred pointed out. the issues, then voting, individually. New England Town Hall over an Electronic Back Fence in Colorado"
war chest, is finessed. Bypassed.